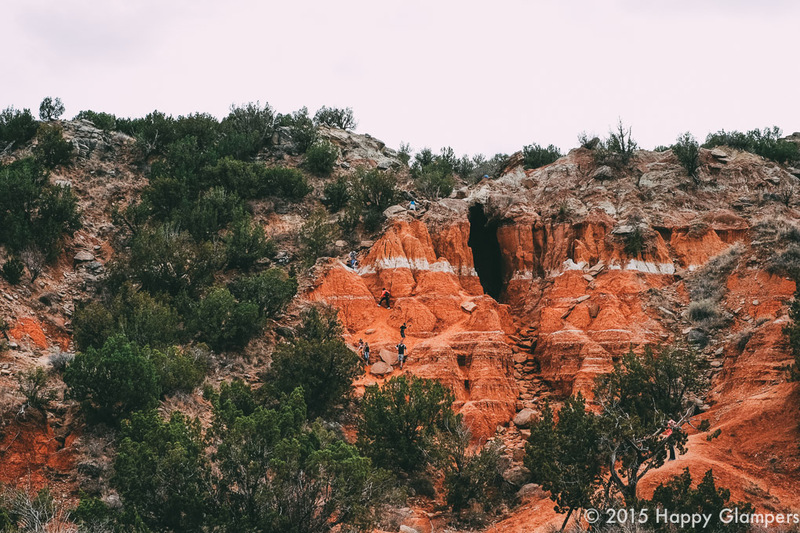 Palo Duro Canyon State Park is about a half an hour drive from Amarillo, TX. The change in landscape is stunningly dramatic You drive from the flat, flat shortgrass prairie until you notice what seems like a little draw on one side of the road. Within moments, your view dramatically opens into hundred-feet-high crumbling canyon walls. Then it’s game on. The canyon quickly yawns wide cutting through the monotonous grassland and revealing the saturated colors of the rock and floodplain below. 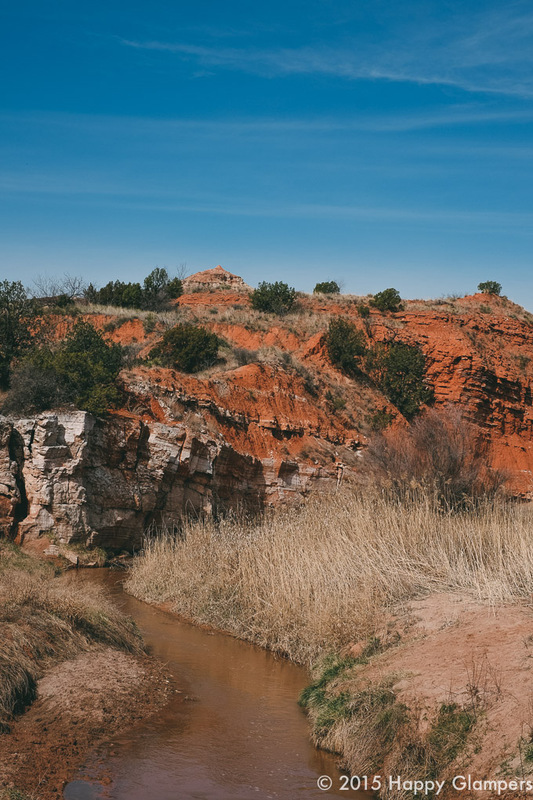 For those of us living in these parts of Oklahoma and Texas, it feels like like we had come across the grand canyon. When you’ve been gazing out on leagues of brown and all related shades of beige, this feels like technicolor. It may be good to note here, that this park does a lot of things extra bright. The first time we camped here, it was after an exhausting day of driving back home from a long glamping trip. We pulled into our campsite, we ate, it got dark, we fell asleep. Then… there were fireworks. Real fireworks, right outside our campground loop. Now, at first, I was all affronted. “Who is doing this at 3 in the morning?!?! Oh, it’s 10:30?” After breathing through the near heart attack this gave me, TJ surmised that this Texas-sized gunpowder display must mark the end of the “outdoor musical drama” called “TEXAS,” which the park hosts annually. So, ya know… be prepared. Do not freak out. It looks pretty fun so maybe you want to check that out too. This is a super busy park. For our second and most recent trip, we visited over a random weekend in March. Even for such an obscure weekend, all the day-use areas were filled, absolutely overfilled, with families having barbecues, and groups of mountian bikers. There are equestrian areas all over the park and you can even take a horseback tour from a concessionaire in the park. There are several places where the park road meets the river, and many of these you just ford through (so beware of you have a low riding glamp-mobile). There were also lots of kids messing about in the river at the crossings, so please do be aware of frolicking. 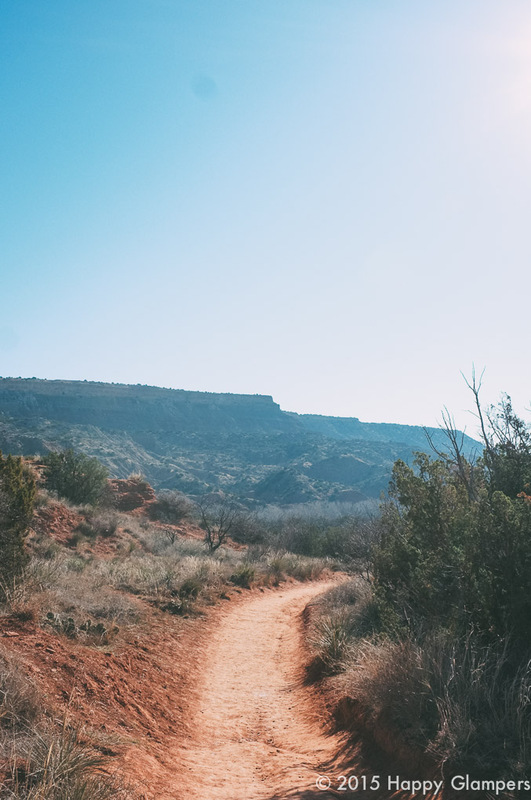 There are just TONS of trails in the park, and a lot are family friendly, but many of these are also designated for mountain biking, we met dozens of them along the Paseo del Rio Trail that follows the river. If you aren’t familiar with this part of the country, we urge you to read up on seasonal weather. In the summer, and even in warm parts of the spring and fall, it gets very hot. Bring plenty of water for everyone and don’t forget any four-legged glamping companions. Signs at the beginning of trails warn not to begin a hike if the temperature is over 80, there is no shade and things can heat up quickly, so please be careful out there! We did get up close and personal with the canyon walls at the “Fractures in the Rock Spur,” and it was super exciting for all. There is a long cave-like structure in the wall here and you can scramble up the rock into the cave and then go ever further to look down into the cave, pretty cool, and you get a lovely vantage point of the lower part of the canyon. Parents, you will need to keep a close eye on little ones up there, but if they make the short scramble to the top, they will think they’ve just climbed Kilimanjaro and are THE STONGEST KIDS ON EARTH. Before I go any further, I must tell you how we got the kids to hike for two miles, ON THIER OWN. We’ve talked about carrying them for family hikes, and that really worked for us, but now, there’s no going back! The freedom! Here was our trick: kids love stories. They can hear the same story over and over, it never gets old. So make them work for it. As we hiked we told a long story. Pick whatever works best for you: a family story, a novel, a movie, anything. I know I don’t even need to tell you that we picked “The Hobbit.” Now here’s the carrot: you can only tell the story when you are walking. So if they stop walking and start complaining, well, the story stops. Two miles, people! Glamping here really was fun! We strung up lots of lights, with solar and electric, draped crochet blankets over all the camp chairs, and mixed up a nice little pitcher of cold adult beverages. I’m determined to keep our cooking and dining habits the same in the camper as at home. That may not be what you are into, but I do love the challenge and the reward of eating a healthy, homemade meal in a lovely spot. On this trip I brought along “One Pot: 120+ Easy Meals from Your Skillet, Slow Cooker, Stockpot, and More” by the gang at Martha Stewart Living, because really, who else would one bring when glamping? I read that sentence again, and realize it really just sums up how I glamp… Oh my poor husband! 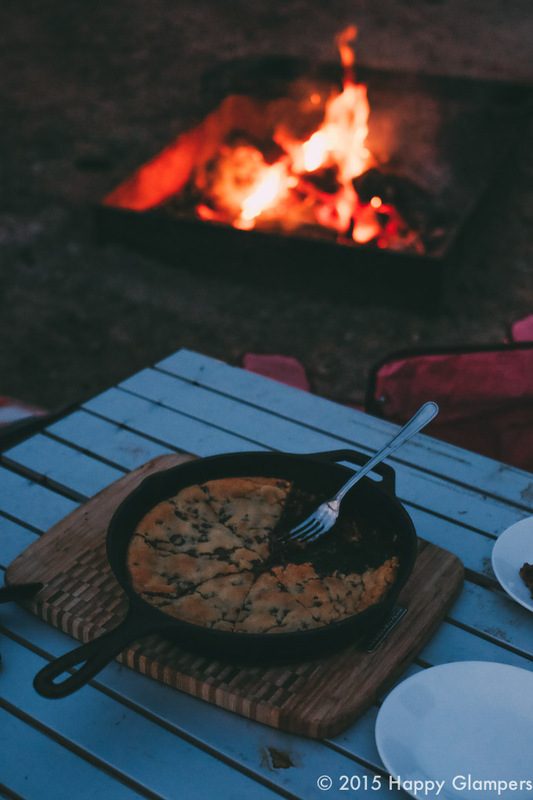 Anyhoo, the meals were great, we only had one pot to clean, and we even managed to make A GIANT COOKIE for our campfire one night and the kids thought that was the best thing ever. I promise to write about our camping cuisine in greater detail in another post! 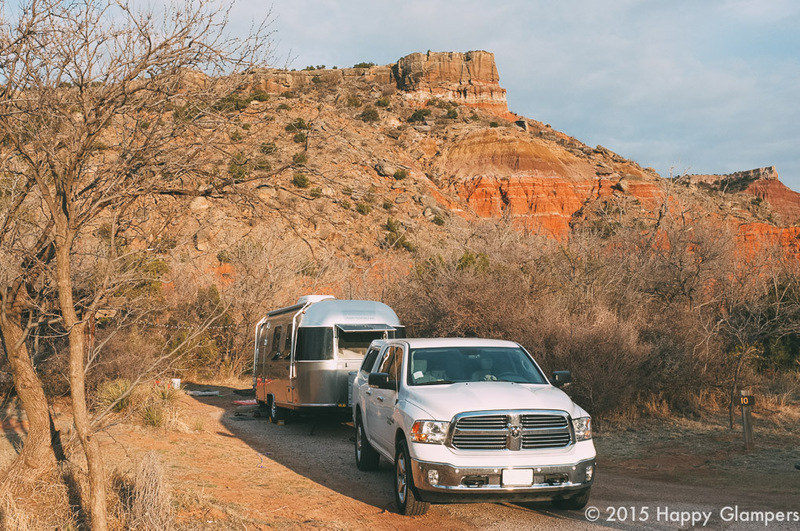 There we were: glass of wine in hand, sun setting on the canyon walls above our little home on wheels, and the kids taking turns digging holes all around the picnic table. So there you go, Pinterest board: done and done. We’d love to hear how you glamp! Who/what are your glamping inspirations? You had me at giant cookie! Looking forward to the cuisine post!